When Europeans first passed through the high desert of the Mojave, they saw it as a harsh wasteland. Onlookers now revere this land the way its natives do, with respect and appreciation. The unique Joshua Trees which only exist in a small region of the vast desert were named by Mormon pioneers after the Biblical story of Joshua who raised his hands to the sky in prayer. These trees are now a sacred attraction that captivate the hearts of visitors from all over the world. 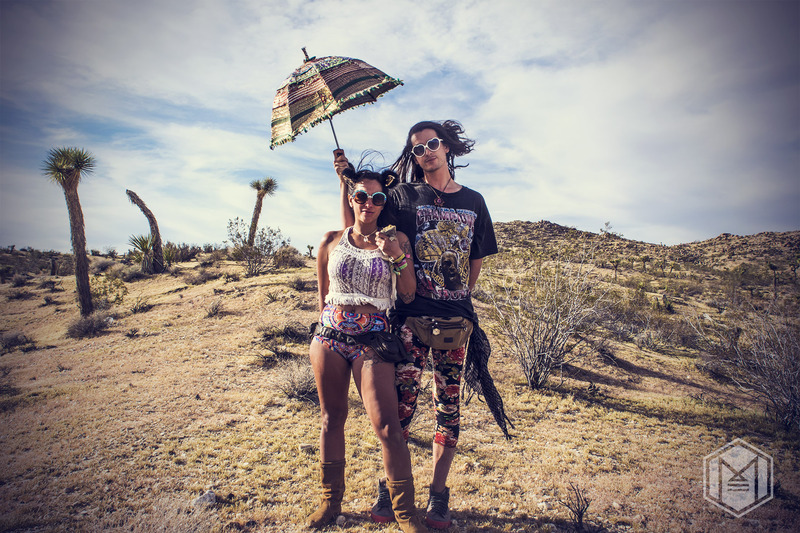 Many artists, musicians and creative minds come to bask in the pastel color palettes and sherbet sunsets of the the Mojave. 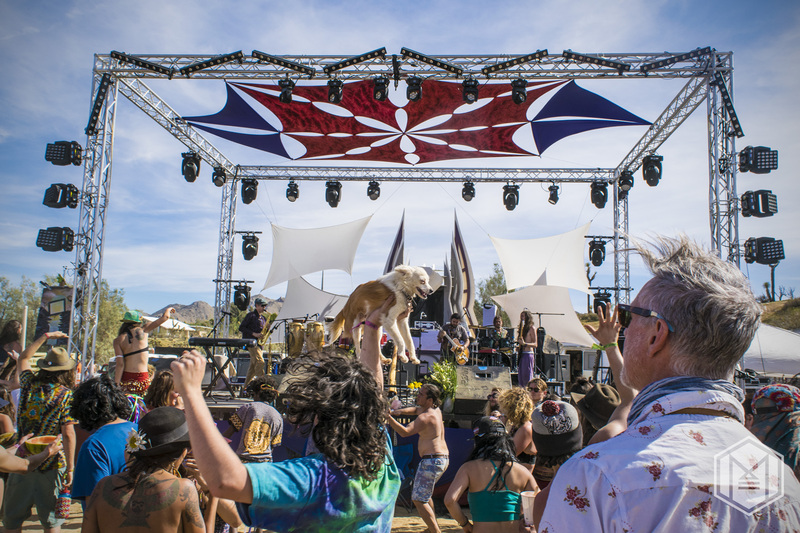 Originally set to take place at Lake Hemet, Serenity Gathering was forced to make a last minute venue change which could have been disastrous. Instead it was a blessing in disguise and quite possibly a fortuitous intervention because there are few places comparable to the magic of Joshua Tree. 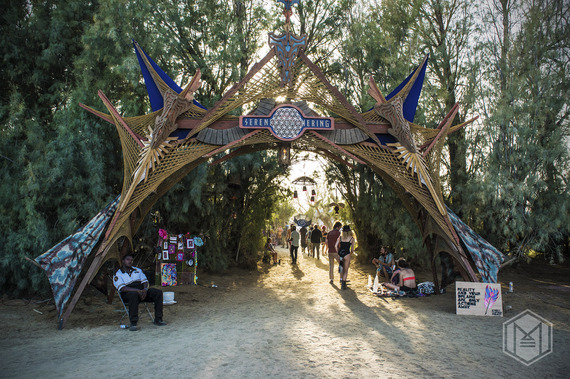 With three stages, the Serenity, Bridge Family, and New Moon, the event was intimate in attendees yet vast in space. With one central area that contained the main stage (Serenity), vendors, yoga and even an interactive area where one could play with the famed Space Harp, the other two stages seemed like an odyssey away in comparison. Though manageable to navigate in the daytime, when the sun went down and intoxicants were consumed, finding one's way back to camp could easily turn into a fool's errand. 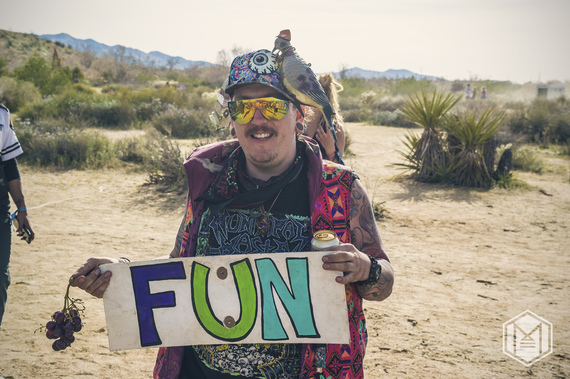 However, most regular festival attendees are no strangers to desert quests so the challenge was accepted wholeheartedly. In only it's 3rd year and first venue change, this event has come a long way from its days at the La Jolla Indian Reservation. Serenity welcomed in the Vernal Equinox which meant blooming flowers and perfect temperatures, the ideal time for desert camping. "Sorry Serenity Gathering. I was told I was not allowed to play because of a noise violation, then another artist proceeded to play my time-slot. Weird indeed. I did actually play a 5 AM set on a side stage though. Maybe next time? At the end of the day I still had a great time and was grateful to be there." Despite the noise ordinance and wonky set times, the consensus was positive and assured that many will return next year. 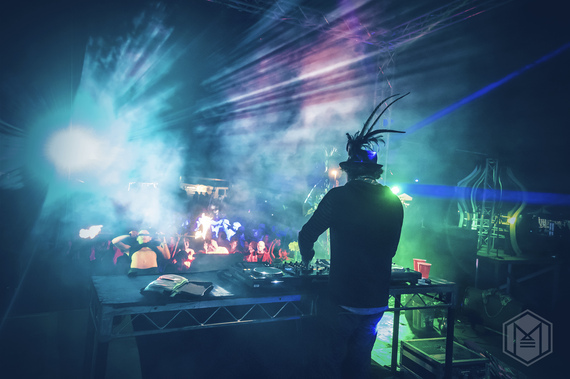 With such a stacked lineup, the music was still noteworthy with artists such as Pumpkin, Shpongle, Desert Dwellers, Mr Bill, Andreilien, Lafa Taylor, Govinda, Dela Moontribe, Stickybuds, Nominus, Clozee, Mumukshu and many others throwing down tasty licks of bass and beats. 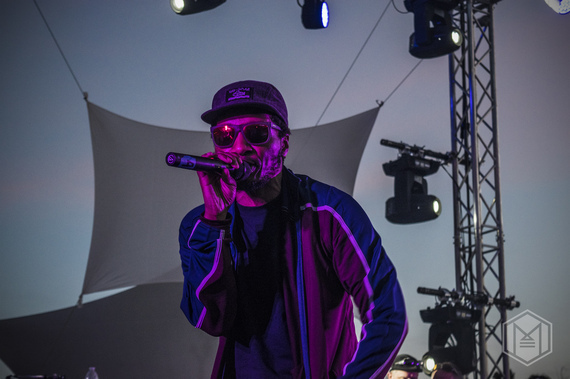 A wide range of musicians in genres outside of electronic also performed such as Afrobeat ensemble Jungle Fire, psychedelic-funk jam band TV Broken 3rd Eye Open, pure funk outfit Pimps of Joytime, and hip hop legend, Del The Funky Homosapien. And of course, there were the performers. On stage, a litany of fire-spinning, staff-wielding, acrobats dazzled their audience with their well-crafted skills. 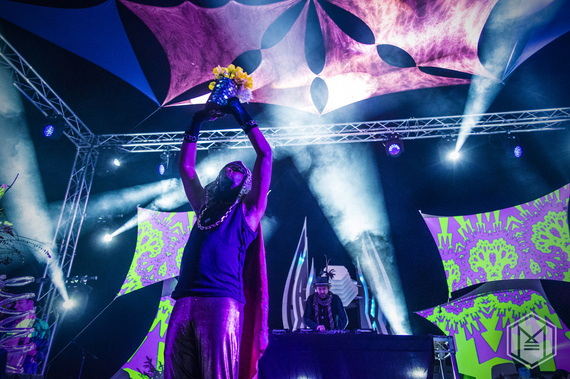 The plant master extraordinaire who often performs with Desert Dwellers, was springing into action, making his way to every stage and blessing the crowd with his flower power. The performance art is never just limited to the stage, however, as stilt-bouncing, hoop-twirling, poi-flinging attendees showed off their moves, being just as much a part of the festival as the performers on stage. Though the organizers of Serenity say they plan to move the event to a venue that will not limit their sound volume, I hope that they find a way to keep it somewhere in Joshua Tree. Aside from the the minor setbacks that are bound to emerge in an independently organized festival, Serenity was an enchanting gathering of some of the festival community's finest. There was even a "trash party" where attendees could sort through camper's garbage in exchange for free beers and enjoy acts such as the late Pumpkin who happily performed for the cause of waste-reduction. Serenity Gathering 2016 was a success, with flaws included, because no matter what happens logistically, if people are smiling, then the mission is accomplished. I met a lady who was there with her two children and her mother, three generations of festival enthusiasts all united under the banner of love, music and community. 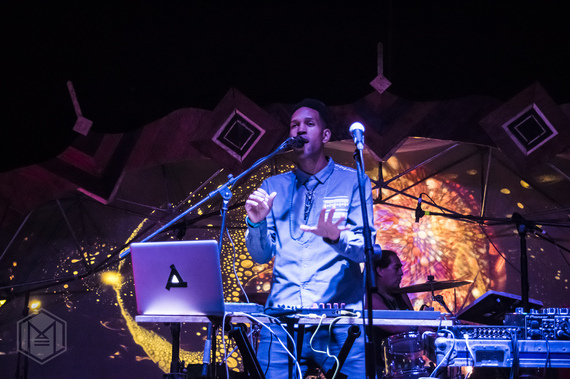 Like the Joshua Tree's namesake, we raised our hands to the sky in prayer through the act of dancing as well as worshiping the holy spirit of music and our all-encompassing Mother Nature. In loving memory of Nicholas "Pumpkin" Alvarado. Serenity Gathering 2016 Teaser Recap from Serenity Gathering on Vimeo.